JAMES GOVAN WANTED THE FAME RECORDINGS. Back in 1967, many an aspiring soul singer headed to Memphis. No wonder. 1967 Memphis was soul central. Labels like Stax and Hi Records called Memphis home. Similarly, Memphis was home to many artists, bands, songwriters and producers. Memphis was also home to many an aspiring unsigned singer. This included a singer who in late 1967, was once seen as the heir to Otis Redding’s crown. His name was James Govan. Jams Govan was born is Charleston, Mississippi in 1949. Then in the early fifties, the Govan family moved to Memphis. Little did any of the Govan family realize that this would prove serendipitous given James Govan’s future career choice. By the mid-fifties, James Govan was playing drums and guitars. He also possessed an impressive and much envied baritone voice. This first came to attention when James was a member of The Vans, a Memphis vocal band. Whilst singing with The Vans, legendary singer, songwriter and producer George Jackson heard James. George liked James voice, and thought Rick Hall at FAME Records might be interested in adding James to his ever-growing roster of artists. So, George took James to FAME Records’ Memphis studio where he’d record a demo. This studio was somewhat no-frills. It’s best descried as a demo studio, which allowed unsigned artists to audition for FAME Records. James, with George acting as de facto producer recorded several songs that George had written. They were sent to Rick Hall in Muscle Shoals, Alabama. When Rick Hall heard James Govan as 1967, he was astounded. James, Rick said was the nearest thing he’d heard to Otis Redding who’d died earlier in 1967. Realizing that James Govan had huge potential, Rick signed him to FAME Records. For a few years, FAME would be home to James Govan. During that time he released a couple of singles, plus twelve tracks that until now, have never before, been release. That is, until Kent Soul recently released James Govan Wanted The FAME Recordings. It features four singles James released between 1969 and 1971. 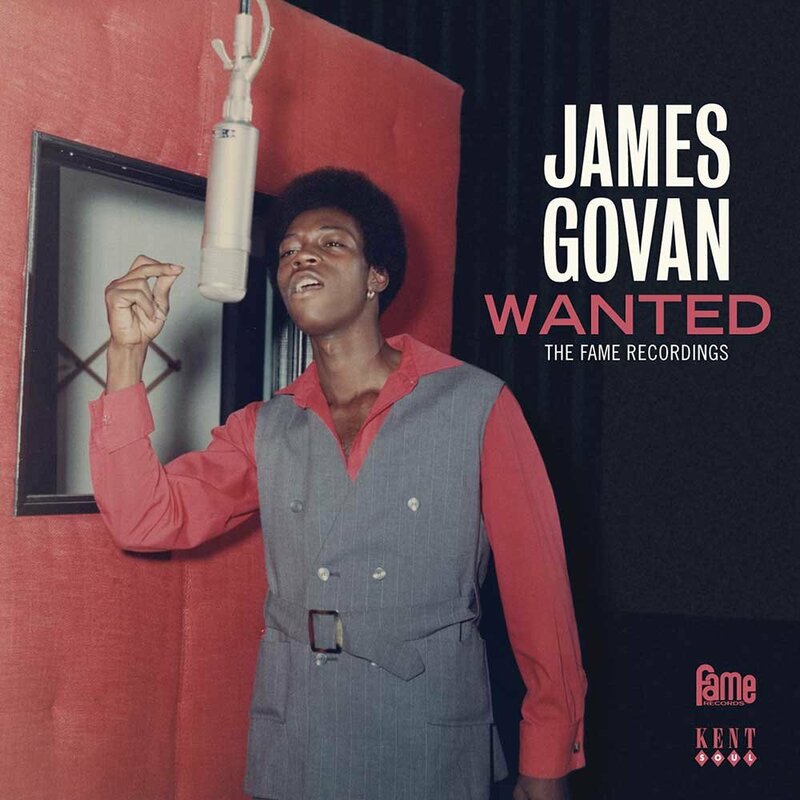 Then there’s the small matter of twelve previously unreleased tracks that feature on James Govan Wanted The FAME Recordings. They’re a tantalizing taste of one of the most underrated artists in the history of Southern Soul, which I’ll now tell you about. After Otis Redding tragically died in a plane crash, he left a huge void that needed filled. That wasn’t going to be easy. Not only was he one of the most successful artists in the history of Southern Soul, but helped bring Southern Soul to a wider audience. With Otis dead, Southern Soul needed a successor to the King of Southern Soul. James Govan was briefly the man who could be King. James Govan was just eighteen when Rick Hall signed to FAME. Rick Hall had liked the demo George Jackson had recorded. When he heard it, he couldn’t believe the similarities with the late Otis Redding. Realising he’d signed such a talented singer, with great potential, wasn’t going to rush James Govan. Indeed, it would two more years before James Govan released his debut single. Nearly two years after Rick Hall had signed James Govan, the time came for the release of James’ debut single. The song chosen by Rick Hall, was Wanted: Lover (No Experience Necessary). Penned by Leonard Caston and Lloyd Webber, it was released in 1969, with a cover of Hank Williams Jambalaya on the B-side. From the opening bars, it’s hard to believe that this is a debut single. Bursting into life, blazing horns, pounding drums and lush strings accompany James baritone. He pleas, power, passion and emotion filling his vocal. Later, it’s tender and needy, accompanied by sweeping harmonies. After that, confidence and sass returns, filling James vampish vocal. Sadly, Wanted: Lover (No Experience Necessary), wasn’t a commercial success. However, it was only James’ debut single. Surely things would get better? Success wouldn’t be far away for James, would it? Over the next couple of years, Rick Hall didn’t give up on James Govan. He kept James signed to FAME, who had several talented vocalists, including Spencer Wiggins and George Jackson. James was regarded as the best of the trio by many people, including Harrison Calloway, who’d produce James’ next single. Rather than a song written by FAME Records’ talented team of songwriters, the George Harrison penned Something was chosen, with You Get A Lot To Like the B-side. This seems a strange choice. After all, the definitive version had been recorded by The Beatles on Abbey Road. Since then, Something was an oft-covered track. Having said that, James delivers a vocal that’s impassioned, filled with emotion and sincerity. The arrangement compliments the vocal. Just a Hammond organ, weeping guitars and rhythm section are later joined by braying horns and soaring harmonies. The result is one of the best versions of Something you’ll ever hear. Sadly, it wasn’t a commercial success. It failed to chart, despite Rick Hall’s relentless promotion of the single. Something would prove to be the last single James released on FAME. While James Govan only released two singles for FAME Records, he’d recorded numerous other tracks. Twelve of them feature on James Govan Wanted The FAME Recordings. These twelve tracks are a compelling combination of cover versions and tracks penned by FAME Records’ talented team of songwriters. Among them were George Jackson. Like so many people who worked at FAME Records, George Jackson was multitalented. Singer, songwriter and producer, George was just as comfortable filling either role. He wrote three tracks on James Govan Wanted The FAME Recordings. These are I Bit Off More Than I Can Chew, Your Love Lifted Me and Oh Baby What You’re Doing To Me. George cowrote You Get A Lot To Like and Stuck On Her with Mickey Buckins. Each of these track showcase George’s songwriting talents. Two tracks stand out. I Bit Off More Than I Can Chew features a heartbroken rueful George, whose voice is filled with regret. Oh Baby What You’re Doing To Me features a desperate, pleading George, who vamps his way through the tracks. FAME Records’ songwriters contribute several other tracks on James Govan Wanted The FAME Recordings. Among them, are You Left The Water Running, which Rick Hall cowrote with Dan Penn and Oscar Franck. Rick Hall also penned I’ve Gone Too Far with Mickey Buckins and Barry Beckett. It features a soul-baring vocal from George, whose vocal is filled with pain, hurt and desperation. Then there’s Take Me Just As I Am written by Dan Penn and Spooner Oldham, two legends of Southern Soul. Heartfelt and filled with emotion, George pleads, begging asking: “Take Me Just As I Am.” The other tracks on James Govan Wanted The FAME Recordings come from some unlikely sources. Indeed, two Bob Dylan tracks are given a Southern Soul twist by James Govan. Just Like A Woman is totally transformed. It’s slowed down, with George unleashing a wistful, emotive vocal against an understated arrangement. The other Bob Dylan track is I Shall Be Released, which becomes a country soul ballad. What was originally a folk song is rejuvenated and given a soulful makeover. Another track that’s transformed is veteran bluesman Arthur Crudup’s That’s Alright Mama. It closes James Govan Wanted The FAME Recordings in style. Blues, rock and Southern Soul combine as James Govan struts through the track, with rocky guitars for company. That’s the perfect way to close this retrospective compilation of one of Southern Soul’s most underrated artists, James Govan. During the few short years James Govan spent at FAME Records, he was the nearly man. the man who could’ve and should’ve been one of Southern Soul’s biggest names. James Govan certainly didn’t lack talent. The sixteen tracks on James Govan Wanted The FAME Recordings are proof of this. Once seen as the successor to the late Otis Redding, neither commercial success nor critical acclaim came James Govan’s way. That seems almost unjust. Surely James Govan deserved better? At least Rick Hall stuck with James Govan. That was until 1973. In 1973, after releasing a couple of singles on FAME Records, James was asked to record a soul version of the country track Frumpy for the Fretone label. That he did. You can’t blame him for leaving FAME Records. Here was a label that wanted him to record and release a single. He hadn’t done much of that for FAME recently. Sadly, still commercial success eluded James. At least he was still a popular live performer in his native Memphis. That’s where producer David Johnson heard James playing with Tony Joe White. Straight away, David knew he had to record an album with James. This was 1982, not a good time for soul artists or soul albums. Once David Johnson had recorded what became I’m In Need, he couldn’t get a label interested in the album. Then a few years later, it was picked up by an English record label. Although I’m In Need was popular with discerning soul connoisseurs, it didn’t give James Govan the commercial success his talent deserved. Since 1993, James has been content to play at Rum Boogie Cafe in Beale Street, Memphis. Five years later, James Govan and The Boogie Band released A Night On Beale in 1998. Just like the music on Ace Records recently released James Govan Wanted The FAME Recordings this is a reminder of what James Govan was capable of. Indeed, back in 1967, when James Govan signed to FAME Records, he was seen as the man who could be crowned the King of Southern Soul. Sadly, that didn’t happen, but the music on James Govan Wanted The FAME Recordings is a reminder of why people believed, James Govan was destined for greatness. Standout Tracks: Wanted: Lover (No Experience Necessary), Something, I Shall Be Released and That’s Alright Mama. ← A ROAD LEADING HOME-SONGS BY DAN PENN AND OTHERS.